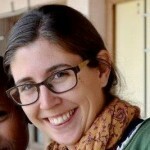 Emily Hoppes graduated with her MA in Bioethics from Wake Forest University in 2011. As a member of the Peace Corps, Emily lives in a tiny village in Tanzania with no electricity or running water, has learned to speak the local language, and attempts to fully integrate herself into the community. Upon graduation, Emily was excited to take her new knowledge to Africa and apply it to the Peace Corps. Once she arrived in Africa, however, she found the problems she had hoped to address were much more complicated. As an avid blogger, Emily struggled to find the words to describe her experiences. Yet, Emily notes, her bioethics education prepared her for such a complex task: analyzing and interpreting problems. Emily quickly found that her bioethics education affected and influenced her everyday life in Africa because it taught her “to look at every angle, look through every lens, and leave nothing out, because that one small thing could make all the difference.” Her MA in Bioethics helped her to document experiences and reflect on even the most extended problems. Emily’s reflections stem from her identity as a MA in Bioethics graduate, a passionate Catholic, and a current Peace Corps volunteer. Her reflections can be found at http://changehearts.tumblr.com/.